From the Baldwin County Courthouse, go east on Hancock St. and follow Highways 22/24 southeast. At the split of Highways 22 and 24, bear right on Hwy 24 (Sandersville Rd), and go for 3.2 miles to Deepstep Road. Turn left at the intersection of Highway 24 and Deepstep Road, go 3.9 miles. Follow the logging road to your left until you must turn either right or left after about 0.5 mile. Turn right and go 0.2 mile or until the road ends in the woods. From the end of the road, walk 420 feet in an east southeast direction. 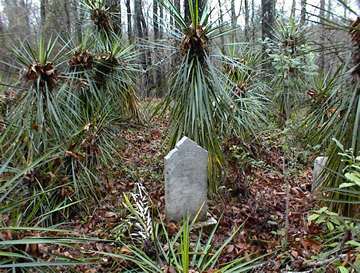 The graves are located in a grove of palmetto like trees. A guide or GPS is recommended. w/o Hugh Butler. She was a kind and affectionate wife, a fond mother and a friend to all. Those who knew him best loved him most. 3 graves, with 2 more possible graves.